Facts and history about the life and lifestyles of Native American Indians. Definition: A travois was a means of transportation devised by Native Americans who had no knowledge of the wheel. It was simply constructed using two poles that were lashed one on either side of a dog or, later, a horse, with one end of each pole dragging on the ground. A netted hoop or ladder of crossed sticks created a platform to contain the load. The name of this form of Native American Indian transport derives from the French word 'travail' in the sense of the "shaft of a cart". 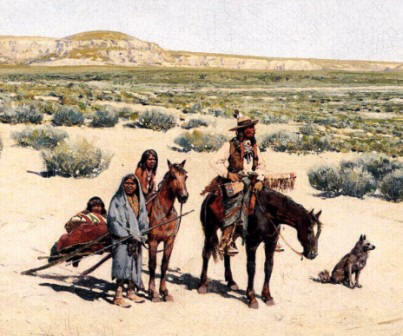 The travois was first hauled by dogs until the late 1500's when the Spanish first introduced horse to the Native American Indians.